A tomato-based sauce made with red wine and garlic, and used as a base for Italian dishes such as pasta, pizza, braised dishes and ground beef, lamb or pork bolognese. 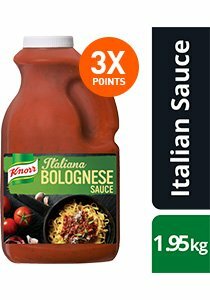 Sauce for pasta, pizza, braised dishes and ground beef, lamb or pork Bolognese. Weight per serving/portion - 78 g.